It has been a very busy and blessed month here at Terebinth Ministries! The Terebinth Ministries School of Discipleship had a blessed week of study this month. We went through the books of Ezra, Nehemiah and Esther. This not only concluded the historical Old Testament books, but also gave us a look at the promises of God being fulfilled in the remnant. This month was all about returning, restoration, and repentance! Not only did we complete all three books, but we managed to take a day “off” as well. On Monday of the class week we went to the Recreation Project here in Gulu and spent a day doing team building, rock climbing and ziplining. We had far too much fun to keep to ourselves, so you can see a short video of our adventures by clicking here. BAM Enterprises is moving along well with several of the crops beginning to grow nicely. We have been getting nice rainfall which helps a lot. Plans to start construction are still underway as we look for the best ways to turn BAM Enterprises into a success. Gerald has also been working hard to come up with the best plan to begin a piggery. The clinic has been undergoing several changes, but the heart of compassion and steadfastness of the staff has not changed. Kristin has had the opportunity to meet with several people who run similar clinics in the northern region. 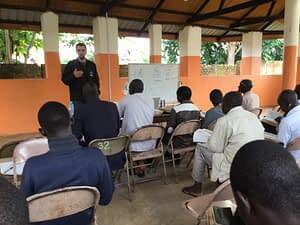 These meetings have provided the Dream Center clinic with several new training materials, as well as some logistical insight. The clinic also recently got a new stock system for the pharmacy. (This probably doesn’t sound exciting, but it was a lot of work to put in the place.) Please continue to lift up the clinic staff as they work hard in training and treating! We have also begun trainings on the 20 most common clinical conditions in Uganda. 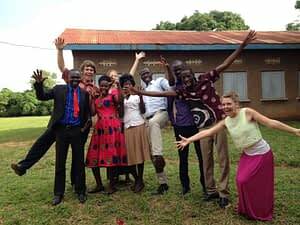 Kristin and Solomon and the opportunity to go to a full day training put on by the Anglican diocese and their clinic staff. Several outreaches have also gone on to provide free healthcare and education to the community! As many of you know, we are very proud to share that one of our nurses, Emma, used the skills from the “helping babies breathe” training to save the life of a newborn just a few weeks ago! Way to go, Emma! We were also blessed to have a team from Touch the World come out. The team was made up of a dance crew who got to do several dance presentations and local churches. We were very blessed by their coming and look forward to hosting more teams from Touch the World and others! We do ask for prayers to continue pouring in as our staff has had a very trying month. Several have had sick family members or deaths in the family. Our staff has faced many trials but they are continuing to work very hard to share the name of Jesus with every single person in the community. I don’t know how it feels out there, but being on the outside reading the updates, it seems like things are moving so fast! God is amazing and His plans are incredible. Praying for you guys!